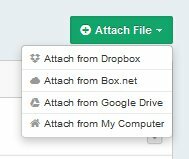 How do I upload files into Wealthbox? Wealthbox integrates with Dropbox, Box.Net, and Google Drive. Users have the ability to upload files from any of these cloud services, or, if you choose to upload from your computer, the files can be stored in the Wealthbox Cloud (which uses Amazon EC2). 1. Navigate to the files page from the left-side panel. 3. Choose the source/service of where you would like to upload. (If you choose an integrated service, you will be asked for your login credentials). 1. Open your contact record page. 2. Click on “Files” above the contact’s activity stream. 3. Follow steps 2-5 above.